The next generation of racing drivers should watch out: the BIG BOBBY CAR CLASSIC RACER is impressive in more than just its quality and features. Its modern design in bright green with a steering wheel and black special racing stickers make it the eye-catcher on any small racing circuit. Thanks to the child-oriented designs, the sturdy construction and the versatile functions, the BIG Bobby Car Classic is the best-selling bobby car worldwide. The car body of this popular kiddies’ car is ergonomically designed to suit the needs of young drivers perfectly. An easy-to-grip steering wheel, four sturdy wheels, a trailer coupling front and rear, and a knee recess for older children round off the play-enhancing features. 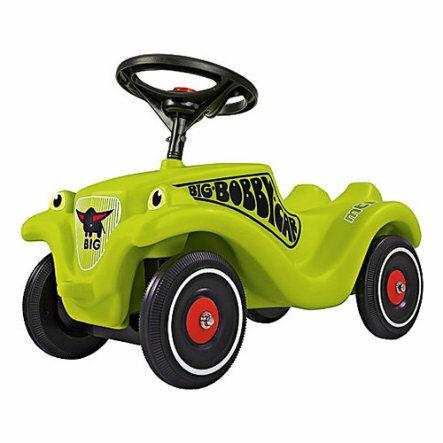 The outstanding manufacturing quality and the low centre of gravity make the BIG BOBBYCAR a particularly safe toy vehicle. • Hard-wearing and economically-friendly plastic material with trendy racing green design. • Recommended age: 1+ years.